Of all the problems people can have with their hair, dandruff is perhaps the most common. Most people experience it at some point in life. Treating it can involve using specialist products which may make you smell bad or, in some cases, even cause allergic reactions. Fortunately there are natural alternatives which can fix the problem and leave you with beautiful, healthy hair. Dandruff occurs when dead skin cells come loose from the scalp. Because cells die naturally after they reach a certain age, everybody experiences some shedding like this, but usually it's very slight and normal brushing is all that's needed to avoid the appearance of flakes in the hair. Certain types of problem, however, can cause skin cells to die and be shed much faster. The most common cause of dandruff is a fungal infection of the scalp. The fungus responsible is one of many organisms that normally lives on the human body without doing any harm, but sometimes a low immune system, poor hair care or similar issues can lead it to expanding excessively. It feeds off the natural oils at the roots of your hair and its waste products damage the scalp. In other cases, dandruff can be caused by an allergic reaction. This is most commonly a response to hair care products, but it can also be a response to parasites or a manifestation of an autoimmune condition such as eczema. As well as being unsightly, dandruff can often be painful, and frequent combing to clear away flakes won't help a damaged scalp. The first thing to do is to switch to a firm-bristled brush for day to day hair care - you can use a comb on tangles further along the length of your hair, but the brush will be much kinder against your scalp. Rinsing the scalp with a solution of bicarbonate of soda in water (about a teaspoonful per litre) can ease the pain of fungal dandruff. This is because the waste product of the fungus, the thing actually doing the damage, is acidic, and the bicarbonate of soda neutralises it. Rinsing like this first thing in the morning and last thing at night means you can work and rest without so much distraction. Whatever type of dandruff you have, you may experience problems because the cells on your scalp are not getting time to develop properly before they're shed; this can leave raw areas. 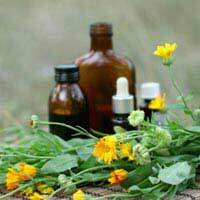 A gentle massage with marigold oil (calendula) in ointment can help new cells to grow faster and alleviate the problem. If you suspect you may have allergic dandruff, the first thing you should do is stop using any new hair care products you have taken up recently. Switch to products you've been fine with in the past or try gentle shampoos formulated for babies. Get a friend to comb through your hair and check you don't have a parasite infection (don't be shy about it - this can happen to anyone, no matter how well they take care of their hair). Your local nurse can help if you don't have anyone else. The most effective natural cure for fungal dandruff is tea tree oil. Make sure you dilute it according to the instructions on the bottle, and try a patch of it on your arm first to make sure you don't react badly. You shouldn't use it if you are or may be pregnant. Tea tree oil can be used when you normally wash your hair for a period of about four weeks, at which point you should see a significant reduction in the symptoms of your dandruff. You can use the oil for a further two weeks if necessary, but it's wise to discontinue it after that. If you follow the above procedures and your dandruff doesn't go away, ask your doctor for advice. Because persistent dandruff can be a symptom of serious medical problems, it's always best to be on the safe side.